These earrings are made up of 14K gold. These earrings are given knot-like design which makes a heart-like shape from the knot and makes the earrings look lovely and beautiful. The size of these earrings is 11mm and these earrings were made as push-back, which makes them easy to wear. These earrings are polished with gold and they give a bright spark when bought under light. The unique design and features makes it a prized possession and owner's pride. This ornament is skin friendly and will surely be your proud possession for years to come. 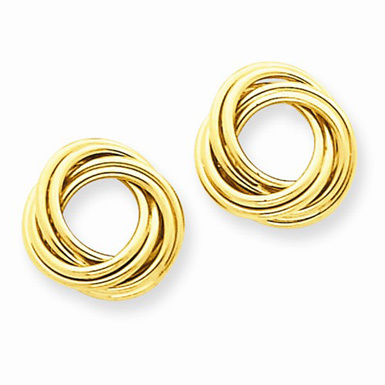 We guarantee our 14K Yellow Gold Polished Love Knot Earrings to be high quality, authentic jewelry, as described above.